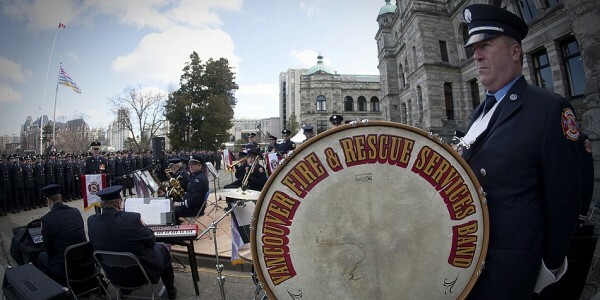 Vancouver Fire and Rescue Services Band | Musical firefighters and friends, serving Metro Vancouver since 1927! A solemn occasion in which we honoured fallen firefighters in a ceremony held on the steps of the Legislature Building in Victoria, BC. 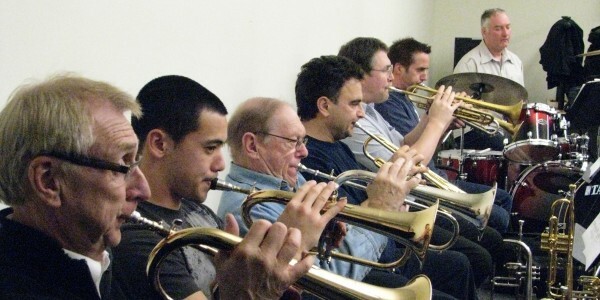 Trumpet section, plus the drummer, of the Vancouver Fire and Rescue Services Band, in rehearsal in Burnaby. 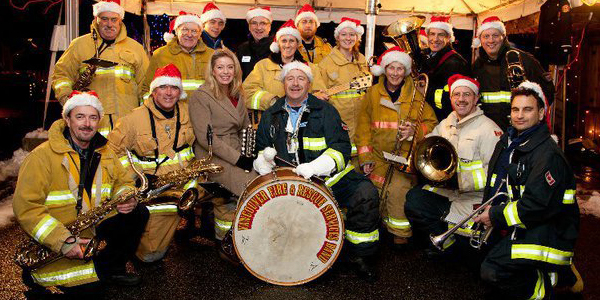 The kids especially love it when the band brings a fire truck or two along for the gig! 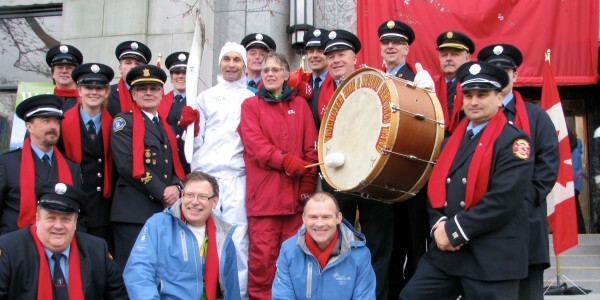 The band and official City and Olympics 2010 dignitaries gather on the steps of City Hall after the Olympic Torch Relay passed by. 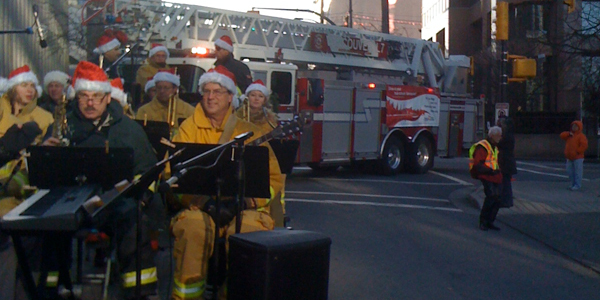 Vancouver Fire and Rescue Services Band and Ladder Truck at the very start of the 2009 Rogers Santa Claus Parade, Vancouver, BC. 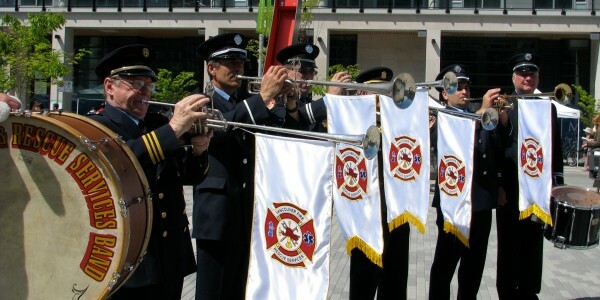 Herald Trumpets, performing for an official City of Vancouver event. 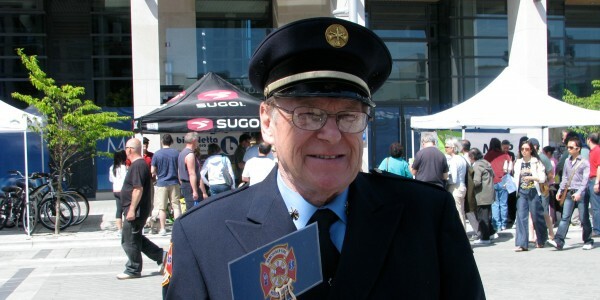 Brian, Vancouver Fire and Rescue Services Chief Training Officer (Ret.) and trumpet player, preparing for an official City of Vancouver event. 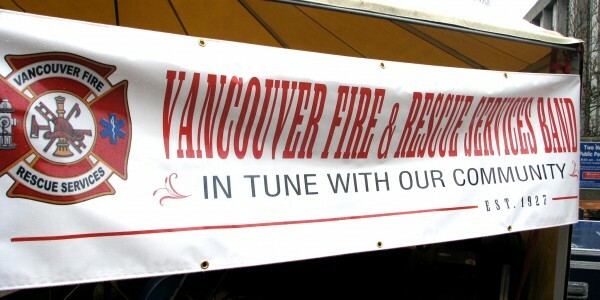 Our brand-new banner, made especially for the 2010 Olympics Torch Relay! 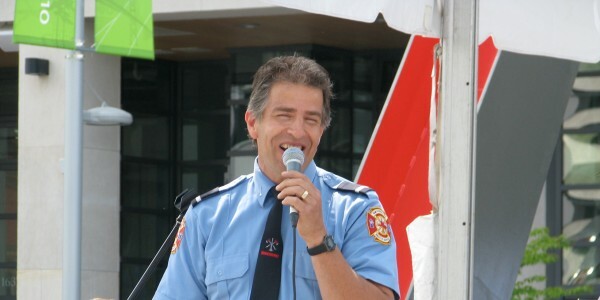 Vancouver Fire and Rescue Services Lieutenant Dan belts out a Frank Sinatra tune! 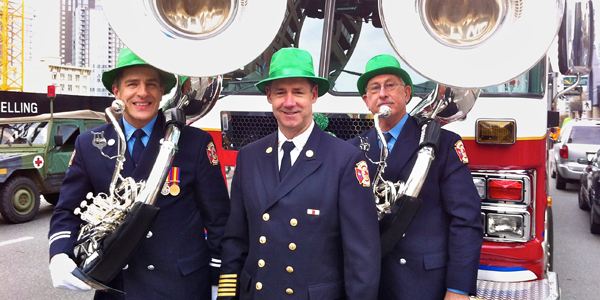 The Fire Chief, John McKearney, with tuba players Dan and Wayne sporting their brand new instruments, in front of Ladder 7 before the 2012 St. Patrick’s Day Parade in Vancouver. 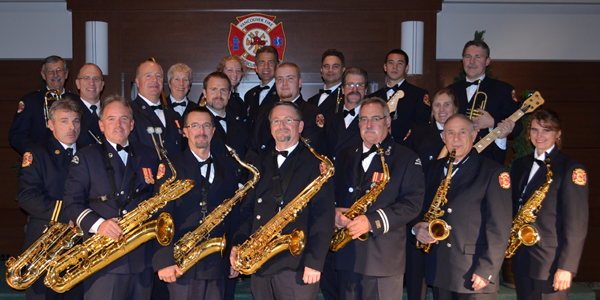 As of Oct 22, 2012, the Firefighters Band is now a formal unit of Vancouver Fire and Rescue Services! One of our favourite times of the year is Christmas! One of our favourite events at Christmastime is the Bright Nights in Stanley Park Volunteer Appreciation Night. We were very proud to participate in this massed band tribute, led by the NADEN Band from Esquimalt, to honour our Canadian veterans and current-serving military personnel at this special half-time show during the final BC Lions’ Game of the season. Looking forward to tonight: we’ll be performing during the BC Lions’ half-time show as part of a big massed-band (lots of bands playing together) to honour military and paramilitary personnel. Top ‘o the mornin’ to ye! ‘Tis a great day to be Irish, you can be sure. See you at the St. Patrick’s Day Parade in downtown Vancouver, March 17, 2013. 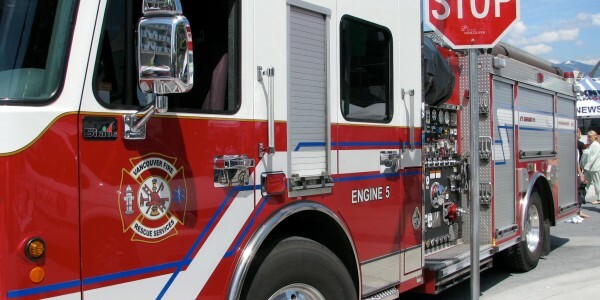 The parade marches off at 11 am along Howe Street, and we’ll be there with our fire trucks and green hats. On the lyre: It’s a Long Way to Tipperary, and McNamara’s band. Make sure you sing along as we walk by! This year’s Chinese New Year in Vancouver’s Chinatown will be the biggest one ever in its 40-year history, and we’ll be there again this year, too!